Ever since 2001, it seems like every French comedy wants to be Amelie. That kind of beautiful whimsy has been inspiring French films (and a few American ones) for the last decade, but no one has yet to match it (not even Jean-Pierre Jeunet himself, who tried to recapture lightning in a bottle with the sadly misguided Micmacs). The result has been a lot of faux-quirky films that are trying way too hard to be charming, but instead come across as forced and contrived. Mona Achache's The Hedgehog is somewhere in between. 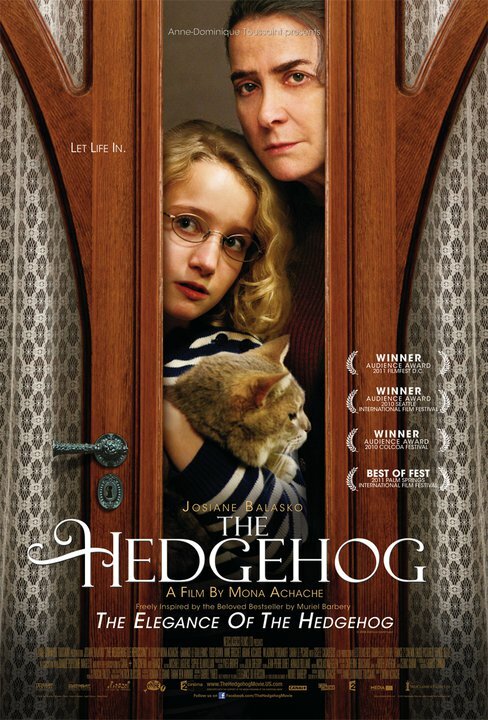 Freely adapted from the novel "The Elegance of the Hedgehog" by Muriel Barbery, the film tells the story of Paloma (Garance Le Guillermic), a depressed, precocious 11 year old girl who is both fascinated and exasperated with the world around her. To her, the world of adults is both absurd and pointless, so she decides that on her 12th birthday she will kill herself. Sounds like a pretty dark concept for a film as lighthearted as this, but Achache handles it well. As Paloma plans her imminent demise, slowly stealing a pill a week from her mother's cabinet, she befriends her apartment building's lonely janitor, Renée (Josiane Balasko), whom her well-to-do family has barely noticed. Behind her prickly veneer, Paloma discovers a tender soul who likes cats and Tolstoy, and she is the hedgehog of the film's title. When a new neighbor, Kakuro Ozu (Togo Igawa), moves into the building, he immediately takes a shine to Renée, and along with Paloma he sets out to bring her out of her shell, and in the process introduces Paloma to the world in a way she never thought possible. And even though she continues to plan her own death as if it were inevitable, she soon learns the meaning of death and love, and that perhaps life isn't quite as absurd as she once believed. It's hard to deny there's a certain charm here. The characters are mostly broad caricatures who are never really more than the sum of their quirks, but the central relationship between Renée and Kakuro is surprisingly moving, even in the rather contrived finale, which takes a twist I always find a bit annoying. If I sound conflicted, it's because I am. There are lots of problems to pick apart in The Hedgehog, but there's something inherently likeable about it. Its themes of judging books by covers are nothing particularly new, but Achache gives the Amelie model just enough of a dark twist to make it unique. It walks a fine line between sentimentality and cynicism, and emerges as a lovely and modern fable.